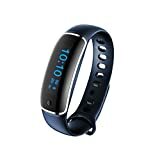 Connect this fitness tracker with the GPS on your smart phone, you will see your real time location/your speed/calorie consumption/sports time and you can save it in App. Control your phone’s camera with this fitness tracker. Other Functions such as Sedentary Reminder, Alarm Etc. IP67: Ingress of water in harmful quantity shall not be possible when the enclosure is immersed in water(max 1 m of submersion, 30mins at most). Also, please do not wear it when showering in winter because temperature of water of showring can not be guaranteed and there will be water vapor in bathroom which will infilter fitness tracker.